Raccoons are very curious in nature, and if they cannot crawl under or jump over the fence, the look for the nearest tree or free standing material close to the fence or house. Raccoons may jump over bird feeder poles, and when they eventually enter your property, they can crawl through dog or cat doors. Raccoons have been found to jump unto houses by first climbing through trees and then jumping on the fence or if the tree is close to the roof of the home, they can jump directly unto such roof. 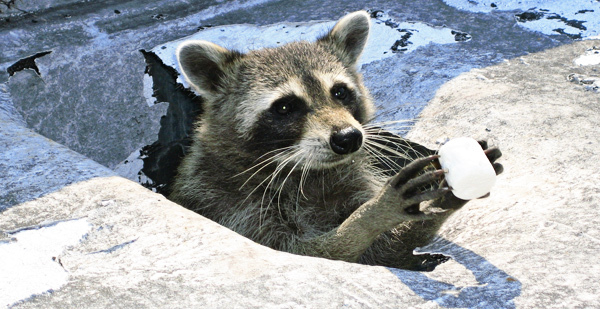 Unlike smaller animals such as rats and mice, raccoons don’t stay too long on house rooftops or chimneys, they look for their prey , pet food or any other item that catches their interest, from on top of the roof and then they can jump on nearby objects where they can easily jump unto the ground. Raccoons can also climb trees easily to gain access to your soffits , thus you need to make sure when you install electric fences, the wires are very close together enough to prevent the animals from getting through. When raccoons eventually gain entrance into your property, they may cause a considerable damage by raiding poultry houses, garden crops or plants, digging up your yard and then exposing your pets and family to some transmittable diseases. Parasites such as fleas, ticks, roundworms, tapeworms and even vectors of rabies are found on Raccoons, these parasites may transfer diseases from them to your pets easily. Trapping has remained the most effective method of preventing raccoons from entering into your property when they jumped over the fence or through the trees. Cage traps are often advisable in urban regions and such traps can be purchased from hardware stores. An ideal cage trap for raccoon should measure at least 10 x 12 x 36 inches in width, length and height respectively. You can include a bait such as pea butter, fruit or un-cracked egg as a bait in your trap and make sure your pets or family don’t move close to the trap. Try as much as possible to attach a bright shining object such as aluminum foil to attract the animal and it is ideal not to use a meat-bait to ensure that your cat or dog does not move close to it. Make sure all trees close to your fence or home are cut frequently to avoid raccoons using their branches to gain access to your property. Go back to the How to get rid of raccoons home page.